This is my contribution for Taphophile Tragics, this week — taken in the Oakwood Cemetery in Lockport, Illinois, this is all that remains of the marker: two broken pieces laying in the grass. 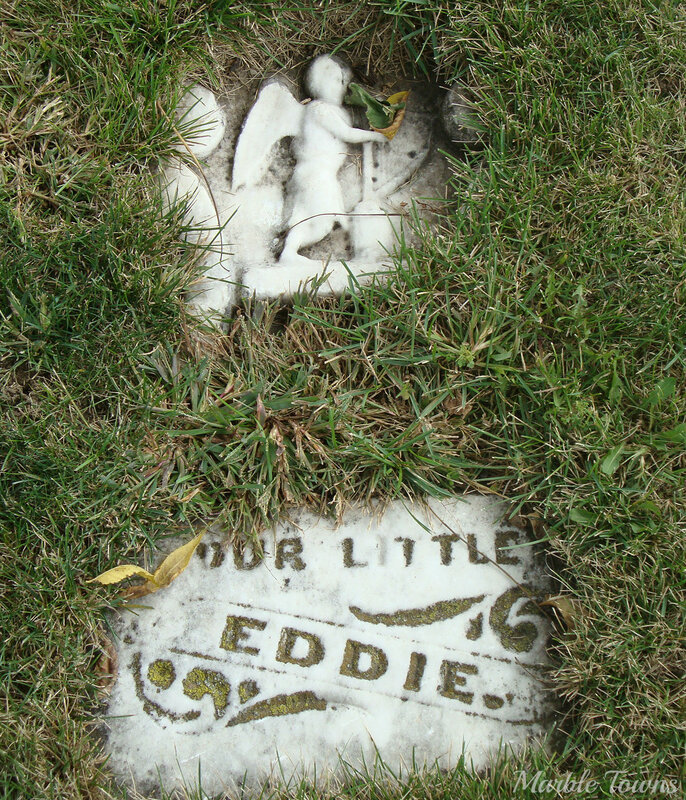 This particular cemetery has a number of stones which have been broken, and unfortunately, I have no idea who Little Eddie was, or how old he was when he died. Find more Taphophile Tragics here — – and thanks very much to Julie, for hosting! 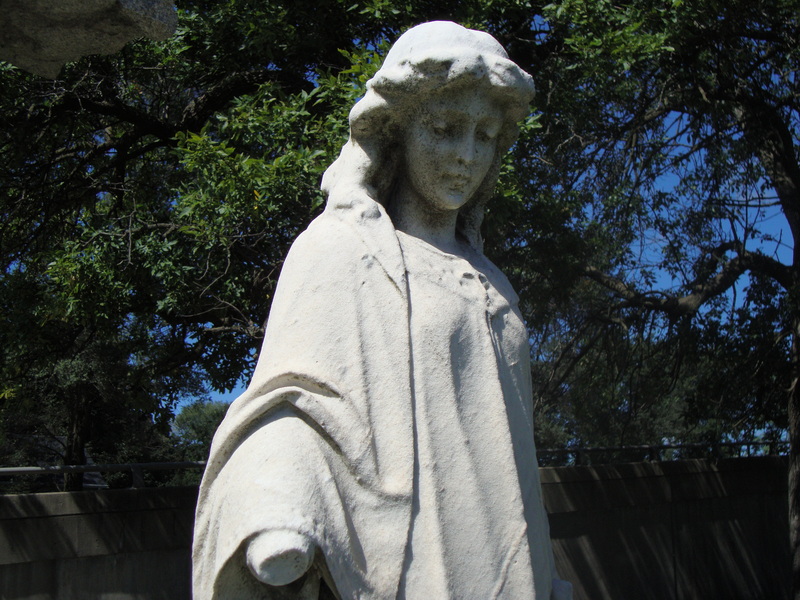 She is in the Forest Hill cemetery in Glen Ellyn, Illinois. 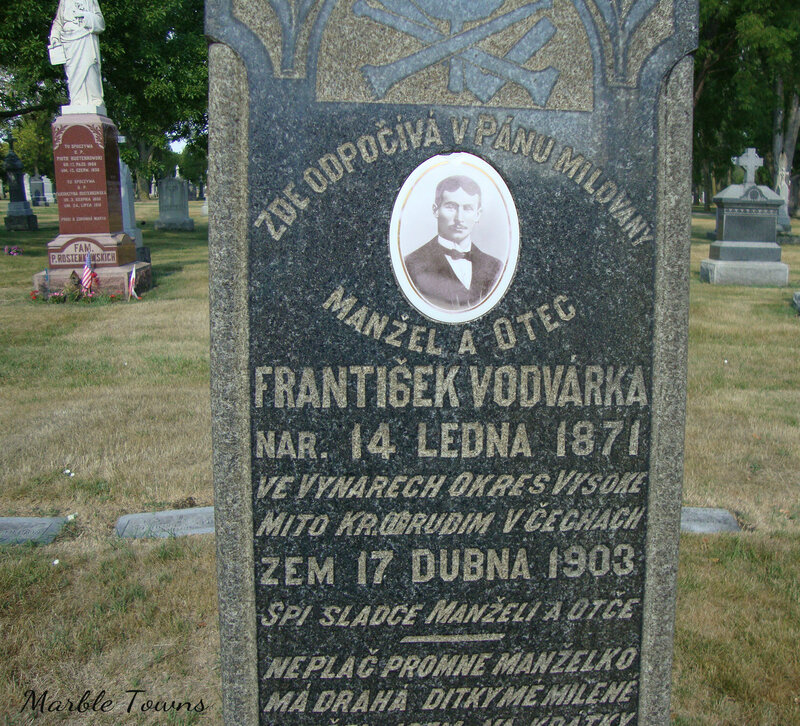 I did a bit of photo manipulation to make the stone a bit easier to read — and I was able to double-check what I thought it said, using findagrave.com. 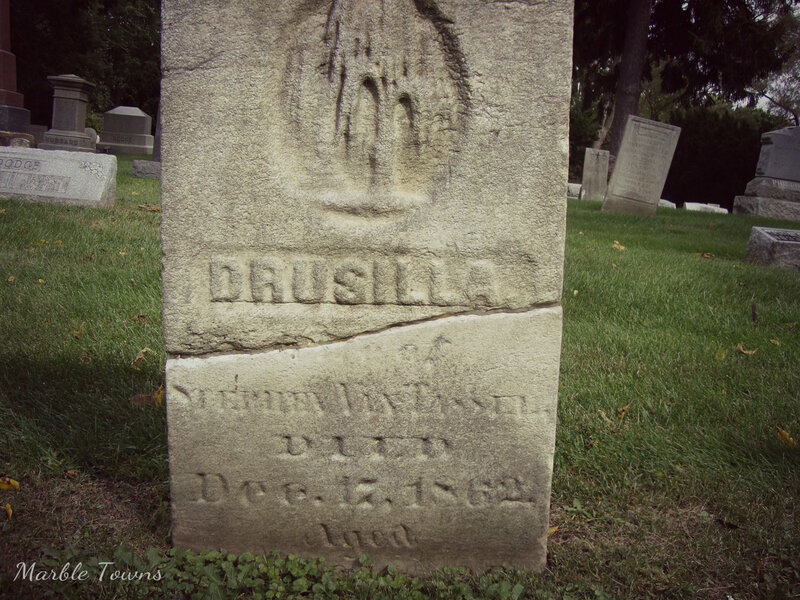 Drusilla VanTassel (yes, just like the VanTassel family of Sleepy Hollow …. ) was the wife of Samuel VanTassel, and died December 17, 1862. The full inscription read: Wife of Stephen, 52y 6m 19d. I have checked census records and found no Drusilla VanTassel, although there were 11 Drusillas in the 1860 Illinois census, and I’m thinking she is most likely one of those women. I also found no Samuel VanTassel in my quick search (although he may turn up if I dig some more). 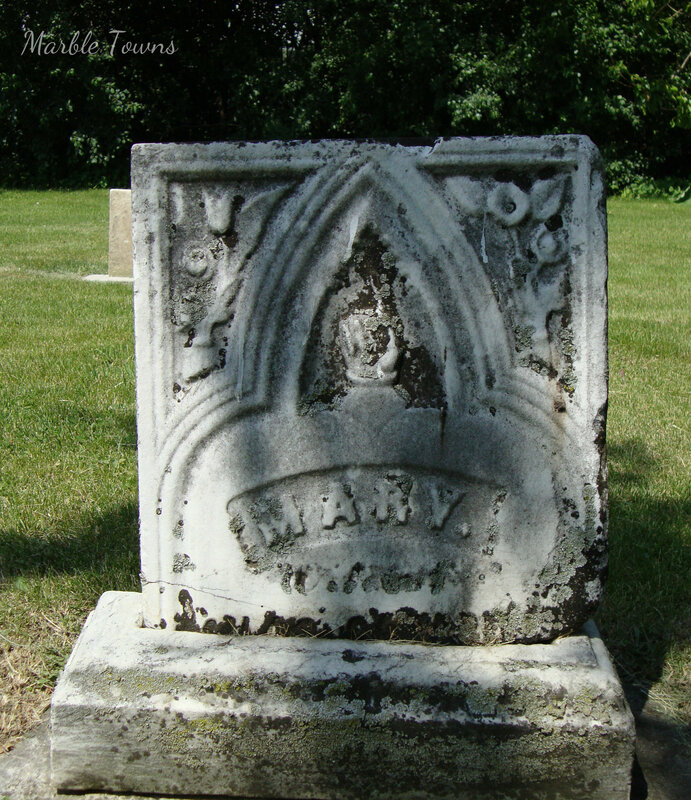 I’m thinking that there may be something to the idea of having a category on this blog called “Mary” because it’s a name I frequently see in cemeteries (I’m also pondering having a category for unusual names, like Sophronia). This stone is quite worn, and has had some repair done. No family name still exists on the stone, but her name, Mary, is still clear, as are the images of flowers and the hand with the index finger pointing upwards. This particular symbol, of a hand pointed up, is very common, and my research shows it’s a symbol of the hope of Heaven, the pathway to Heaven, or the idea of Heavenly reward. Unfortunately, this is all there is — there is no more to her name, and no dates. I took this photo in the Elmwood Cemetery, in Dekalb, IL. I took this photo in St. Adalbert Cemetery in Niles, Illinois. My husband has family buried in this cemetery, and we thought it might be interesting to wander a bit to see what else was here. This stone caught my eye, first because of the ceramic photograph of this man, but also because I was curious about what the stone said. In the Chicago area, there is a substantial Czech population, and this last name is one that is found in Chicago census records from this time period (although I did not find this particular man with these two dates, which does happen with census records), and there are current Vodvarka families in the Chicago area, as well. As I said, this translation is my trying to make Google translate work — but I definitely get the impression that this man was loved by his family. I’ve been curious about these kinds of photographs on ceramic — some cemeteries have quite a few, and some have none at all. I’ve done a bit of research and found that for some ethnic groups, this is fairly common on stones. I also found an interesting article here, on The History Channel’s site, which also mentions a book called Forgotten Faces: A Window Into Our Immigrant Past — my library doesn’t own this book, so I’m requesting it through interlibrary loan (can’t wait)! 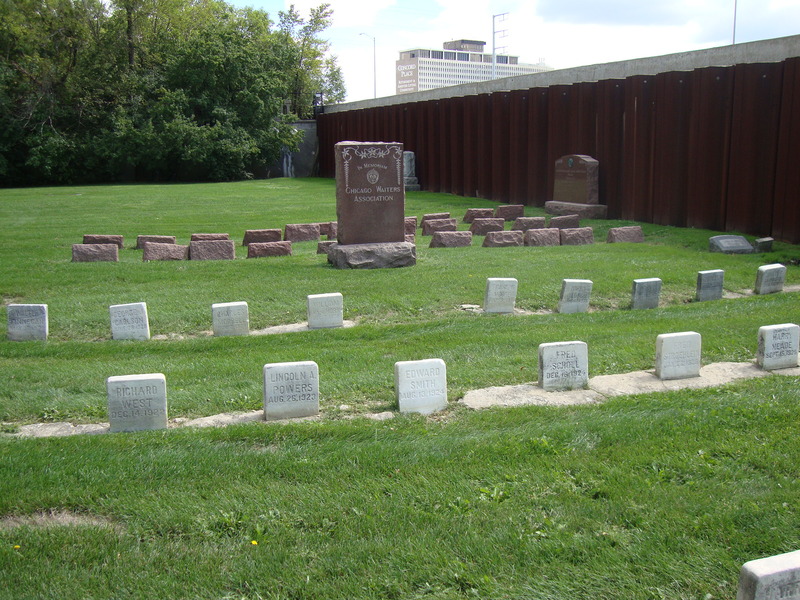 I was recently in Arlington Cemetery, in Elmhurst, Illinois, which has several sections set aside for not only Spanish-American war veterans, but also a few other groups, including the Chicago Waiters Association. 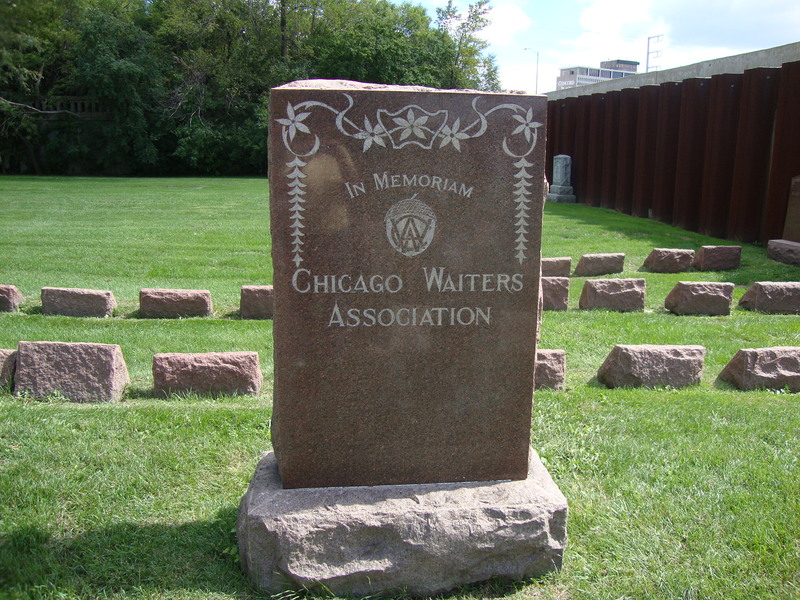 The individual markers don’t have much information on them, but I was able to find out a little bit about the Chicago Waiters Association. The Waiters Union, Local 35 and the Chicago Waiters Association, which have existed as two distinct organizations in one trade, have now united into one union, Local 7, to which members of both bodies will belong. The Jewish and non-Jewish waiters belong to this union. Now that all are 8organized it is expected that the union will improve the working conditions of all restaurant employees. I did a bit of research, and Local 7 now appears to be SEIU Local 7, which represents public service employees in Illinois, and which is an active union. Taken in the Saints Peter and Paul Cemetery in Naperville, IL. See more WW! My husband and I visited the Arlington Cemetery in Elmhurst, Illinois recently, and he found this marker, which we thought looked interesting. We didn’t know what W.A.I.T. meant, although we thought we remembered something about what the Doolittle’s Raid was. I did some research, and found not only Maxie’s obituary, but also some information on the Doolittle’s Raid. According to her obituary, “Maxie served as a Womans Air Instrument Technician (W.A.I.T) during world WW2. She was on the team that prepared the instruments on the 16 B-25 bombers used in Doolittle’s Raid over Tokyo. She recalled flying with and calibrating General Doolittle’s plane personally.” So now, we figured out what the W.A.I.T. was. Doolittle’s Raid was on April 18, 1942, and was a secret raid made by the U.S. on Japan, about four months after the bombing of Pearl Harbor. On that date, 20 B-25 bombers left on the mission, but none of the planes made it back. However, most of the 80 crewman who flew the planes did survive. I found two interesting articles, one on NPR, and the other on Naval History.org, if you’d like to read more. Maxie sounds like the kind of woman I would have liked to meet, and hear her stories about being a member of the W.A.I.T. Arlington Cemetery had a number of interesting parts to it, including several sections dedicated to people who had served in the Spanish-American War. I’ll be posting more photos from this cemetery on the blog in the coming weeks. I have been doing a bit of research into this cemetery, since it apparently a privately owned cemetery, but has numerous sections for veterans. I found an interesting article in the Chicago Tribune, and plan to look for some more information. This is my post for Taphophile Tragics this week. This photo was taken in the Warrenville, Illinois cemetery. 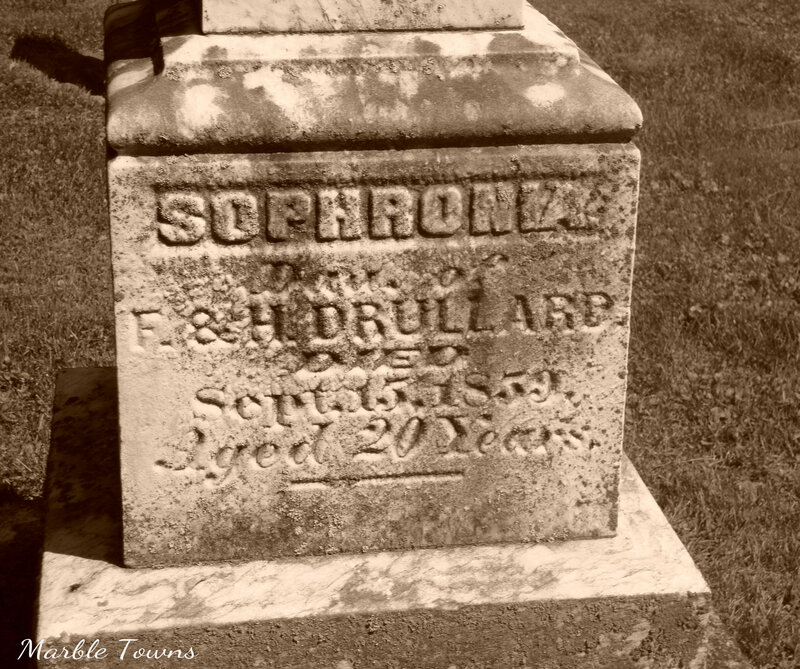 The stone had some damage on the top, but what drew me to it was the name of this woman, Sophronia (definitely not a common name these days). 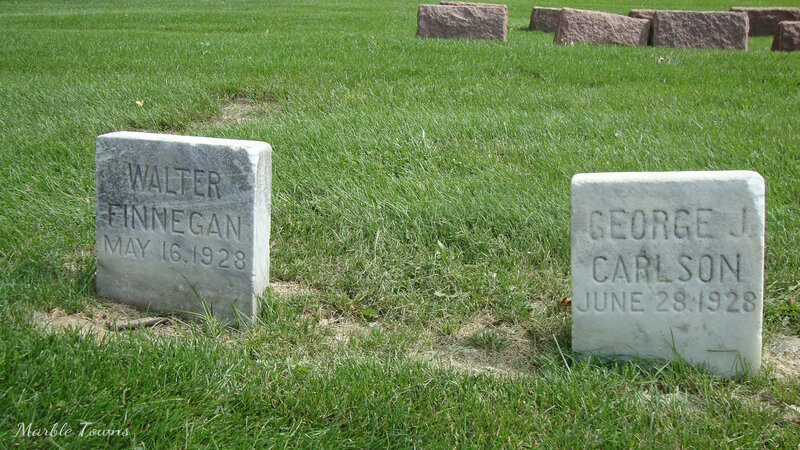 I did look into the census records for this part of Illinois, to see if I could find out some information about her, or the family, but nothing turned up. I do wonder about who she was, and what happened to her — 20 years old isn’t a very long life, even in 1859. However, it’s nice to see that the face of the stone is still in pretty good, readable condition. Find more Taphophile Tragics here! I know this is Wordless Wednesday, but I wanted to include a bit of info about this photo. 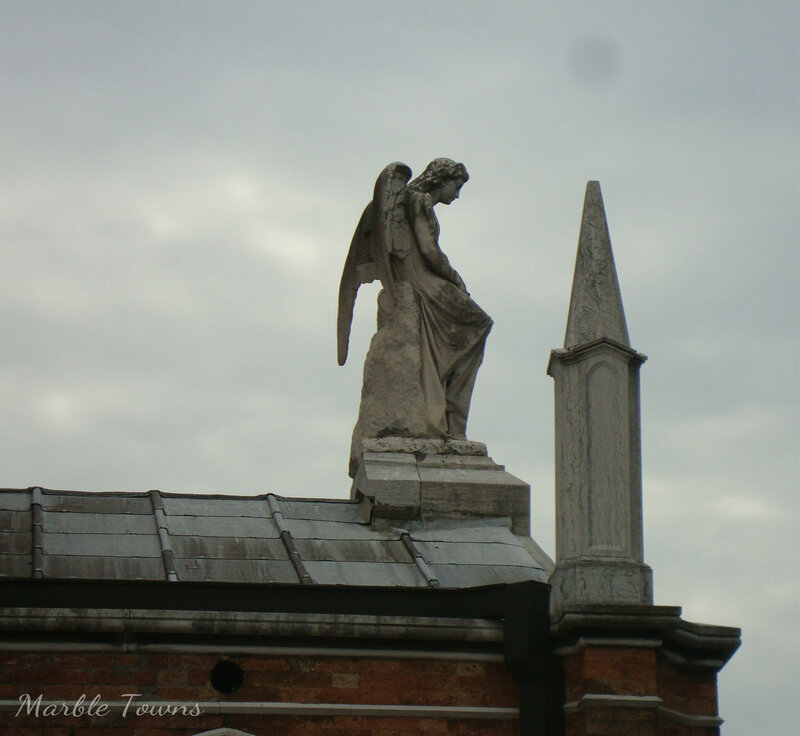 This is a detail from the roof of the San Cristoforo della Pace chapel in the San Michele cemetery (Cemetery Island), Venice, Italy. To lean more, here is a link, — and to see more WW, click HERE. 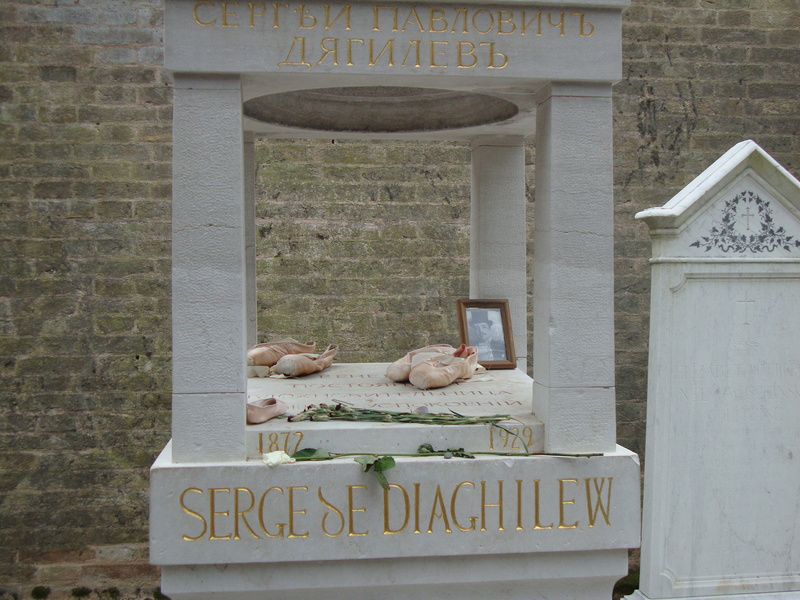 This is the grave of Sergei Diaghilev, at the San Michele Cemetery in Venice, Italy. 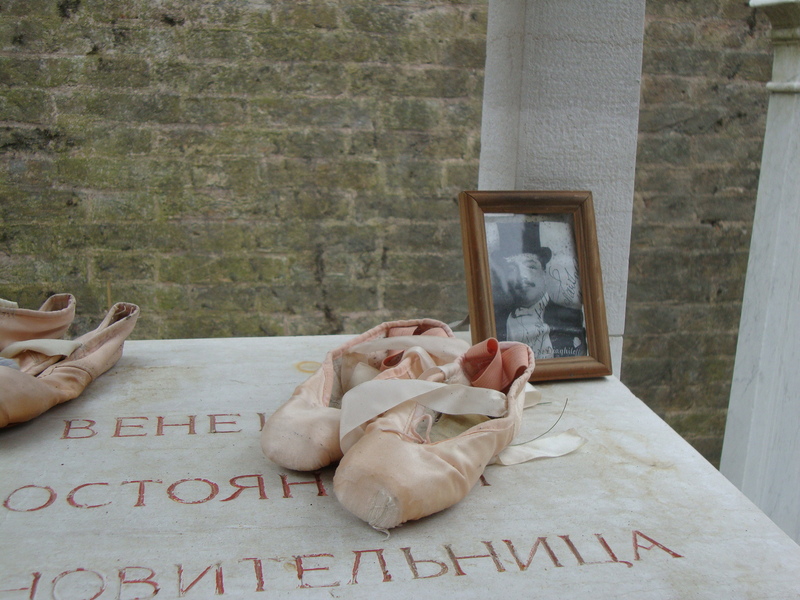 Founder of the Ballet Russes, it’s not unusual, apparently, to see toe shoes left here . He died in Venice in 1929 (and if you’d like to read more about him, there’s a nice Wikipedia article here). I took this photo last Spring (2011).